Strut Your Stuff: Wine collections are impressive. But just how impressive are they while they're tucked in a cabinet, down in a dank, or in a dirty wine cellar? Not very. 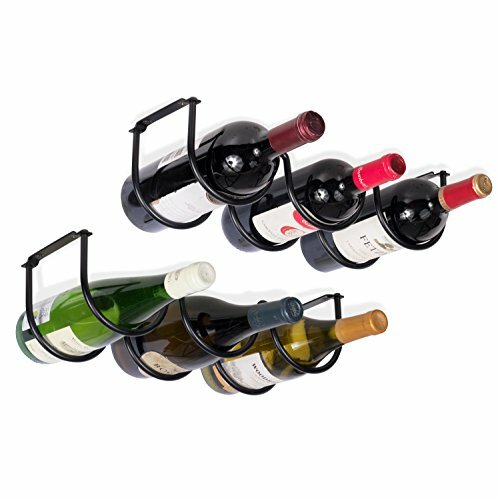 Use these durable iron wine bottle holders to show off your fantastic taste in wine, vodka, or any other adult beverage. Display Your Wine with Class: You can use these durable metal bottle holders under any shelf, hutch, buffet, cabinet, credenza or bar storage. Display your expensive and delicious wine bottles in your dining room, living room or kitchen. Multi-Purpose Storage Solution: This metal under-cabinet rack is perfect for the person who loves baking. If you have a collection of rolling pins and don't know where to store them this rack will be your savior. Makes the Perfect Gift for Any Occasion: You can get this wine storage rack for a housewarming, Christmas, New Year's or just because. Make your wine lover friend or family member happy with this amazing storage solution. easily reach for your favorite bottle to devour with friends and family, the multi-use options are great for storing towels, bed sheets, baby wearing wraps, and so much more. towels, baby wearing wraps, bed sheets and linens or other things that will fit with ease. Don't wait! Order yours today while supplies last and have it delivered to your doorstep. Each Rack's Dimensions: 14" x 4.5" Bottle Holder Diameter:"
Bring the Class: This durable iron wine rack is quite a space-saver, mount it under your kitchen cabinets and clear the mess sitting on your countertop. You will receive set of 2 sturdy metal rack holds 3 bottles of wine or other liquor each. Durable Iron Gauge Frame: For a stylish décor and easy clean-up in your kitchen set-up this streamlined style holds your bar storage intact and tidy. Each 15.25" x 4.5" 5" rack with the necessary installation hardware and tool . Wine Overload: Feel like a gourmet cook right in your own kitchen and be the envy of your friends with your exquisite taste in wine. Show everyone that you're a wine connoisseur with your absolute favorite bottles. Space Saver: Your special wine or liquor collection deserve a royal treatment. Bring your bottle out of the wine cellar, pantry closet or kitchen cabinets to free-up valuable space for other kitchen essentials. Amaze Guests: This liquor bottle rack is made of 8 mm wrought iron built to last you years to come, it is rust-proof, solid and sturdy enough to hold a sufficient amount of weight, so carrying bulky and heavy bottles is no longer a hassle.